Throw pillows. The name says it all. With all the different shapes, sizes, fabrics, and embellishments, the options are endless. But did you know that historically, the amount of money a family had determined the number of jewel-covered pillows on display? And although I’m not into the jewels (on pillows that is), I do like the idea of personalizing pillow cushions. There are so many creative and fun ways to bring a splash of color and design into your room by just using throw pillows. We are very excited to be a part of this month’s #12MonthsofDIY challenge. 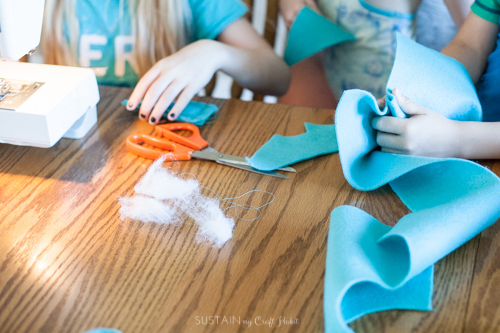 For the month of July, each of the 12 Canadian bloggers will be using The Kunin Group Eco-fiPlus™ Premiumfelt to create an inspiring DIY or craft project. Last month, we used spray paint as part of June’s challenge. 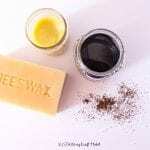 You can check out how we upcycled outdoor decor using spray paint as well as loads of other helpful and surprising uses for spray paint from the rest of the talented bloggers. 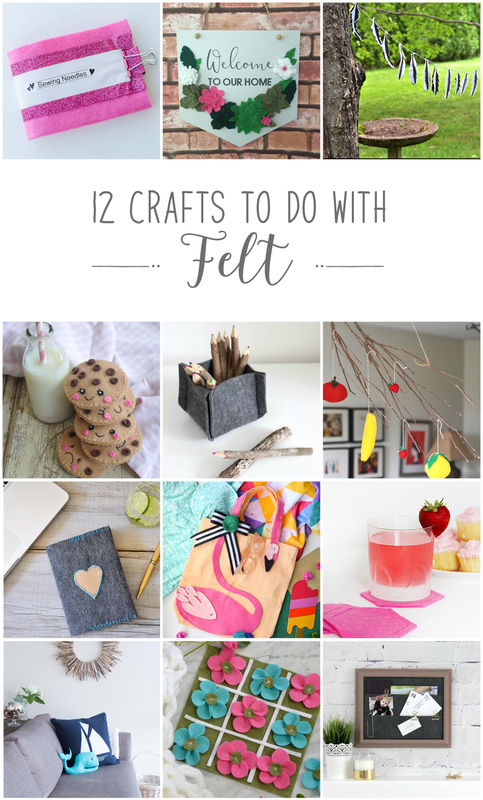 And make sure to check out all their fun ideas for using felt fabric at the end of this post. If you’ve been with us for a while, you already know how important sustainability is to us! It’s in our name, after all! 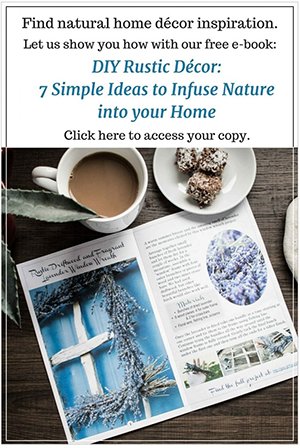 We love to challenge ourselves by using supplies we already have on hand or to use materials from nature in unique ways. The Kunin Group Eco-fiPlus™ Premiumfelt, the material of choice for this month, is made of 100% polyester fiber, made from recycled post-consumer plastic bottles. 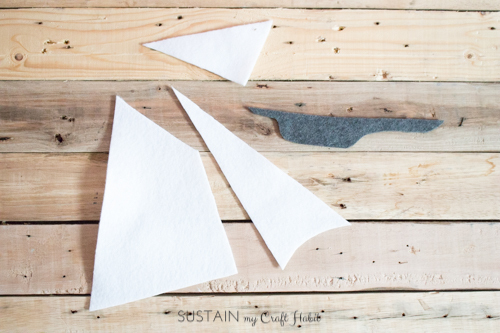 The felt is soft, vibrant and sustainable making it ideal for garment, accessory, decorating, and home décor crafting projects. 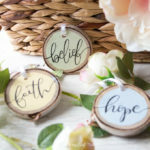 Yet one more reason to feel good about crafting! How amazing is that? Two million plastic bottles are used in the U.S. every five minutes and 51 billion plastic bottles go into landfills annually. 1. 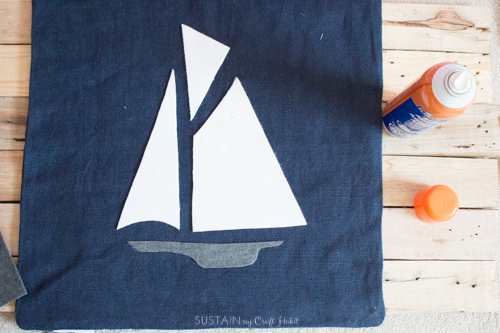 Using an enlarged size of the sailboat stencil, cut out the base of the sail boat in the smoke colour and cut out the sail of the boat in the white colour. 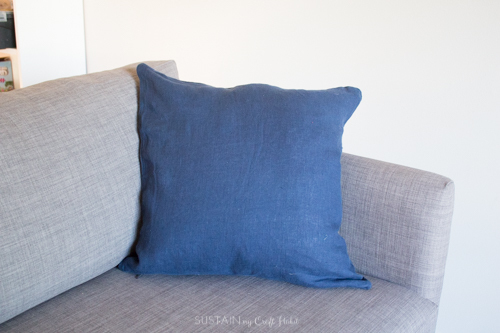 Craft Tip: Look out for those solid colour pillow cushions to use for a DIY project (these often go on sale at the end of a season). 2. Mark the placement onto the pillow case with removable chalk. 3. 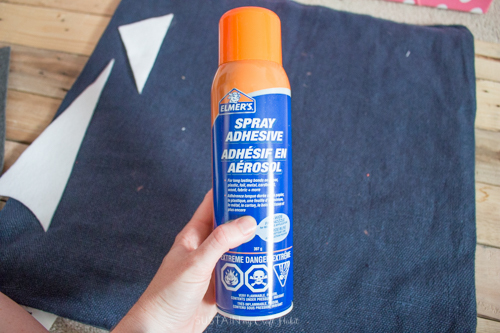 On the back side of the felt, use spray adhesive and lightly coat the surface. 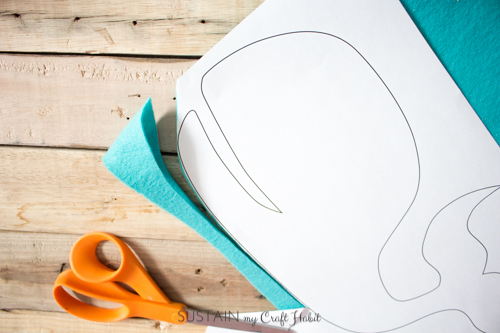 Apply the glued side to the cushion and apply light pressure to help adhere to fabric. 4. 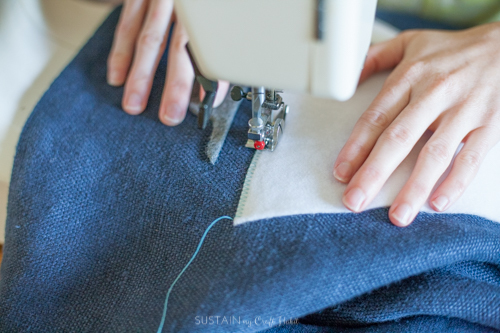 Using a sewing machine, set your stitch type to zig zag. Replace presser foot to zig zag foot. 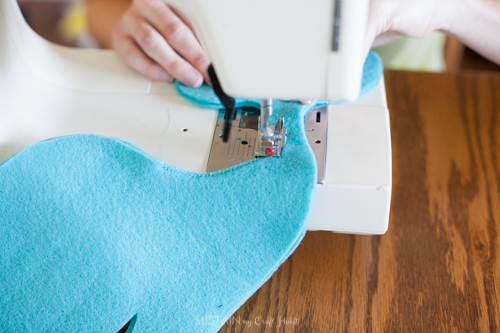 Using thread colour of your choice, begin to zig zag stitch around the edges of the felt onto the cushion. Trim all loose threads. Insert pillow form. And enjoy! And what nautical theme is complete without an adorable whale? We also couldn’t resist using the Fusion Mineral Paints Tones for Tots whale stencil for this project! 1. 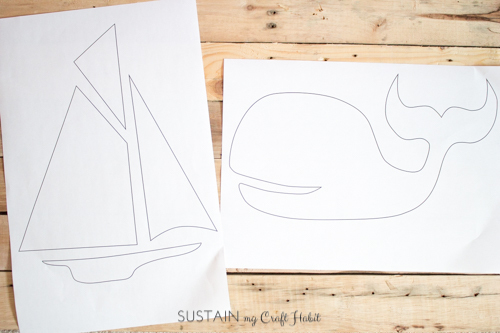 Trace the whale stencil onto a piece of paper and then photocopy and enlarge the image to use as your template for cutting the felt fabric. Cut out two whale pieces in the same colour. 2. 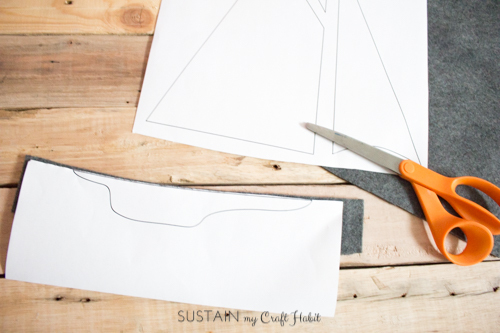 With a sewing machine set to zig zag stitching, begin to zig zag stitch the two pieces together (alternatively you could hand stitch around the outer edges using a tight whip stitch). Make sure to leave an opening of 2” on both ends for stuffing. 3. 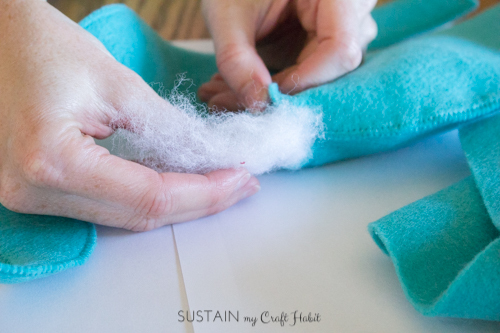 Fill the opening with polyester stuffing until desired thickness is achieved. Close the openings by continuing with the zig zag stitching. 4. Finally, attach the driftwood button eyes and enjoy! 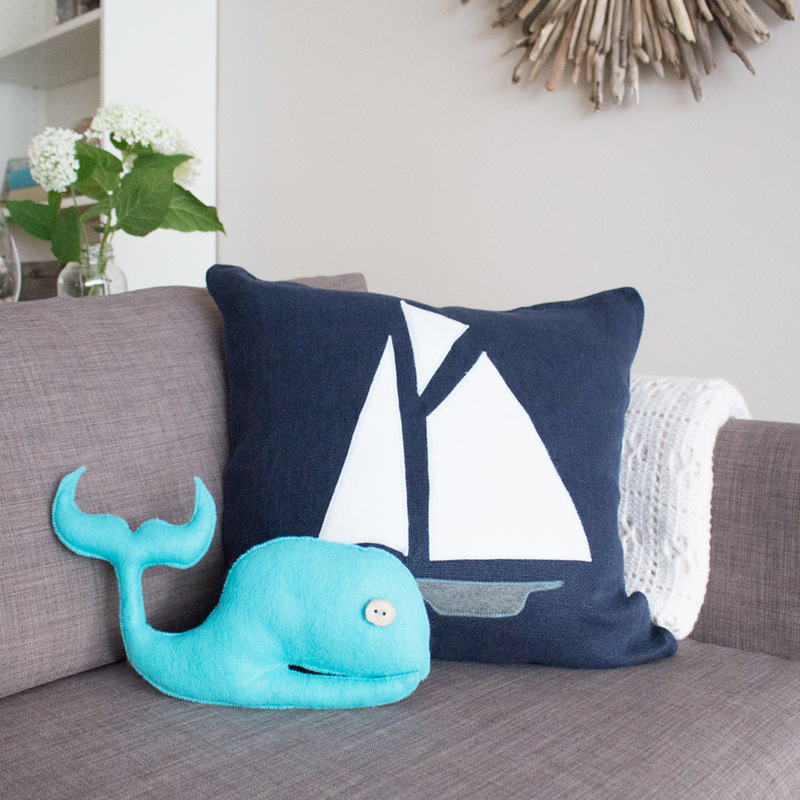 The kids couldn’t get over the cuteness of the whale throw pillow as I was making it. Each one was asking if they could keep it! 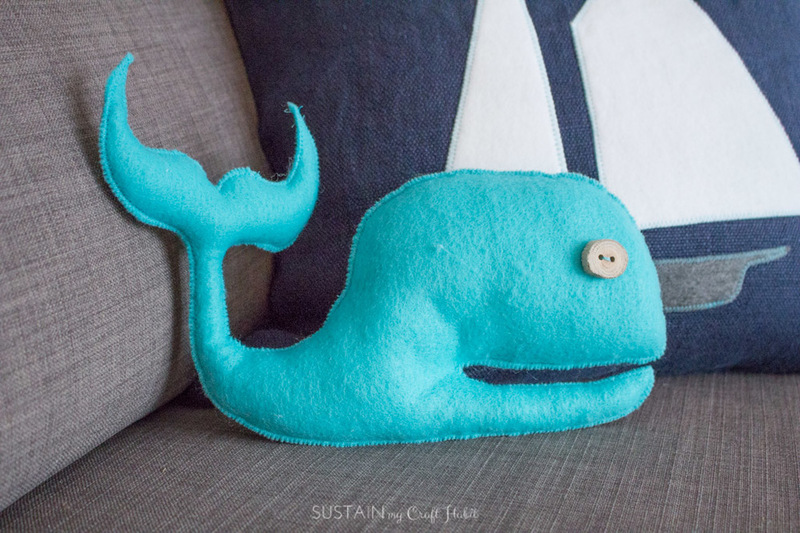 So it looks like I’ll be adding 4 more whale pillows to my list of projects to make. And happily, I gave my 9 year old niece her very first sewing lesson using this wonderful felt. She made herself a “squishie” toy, which she has proudly been admiring ever since. Let’s all do our part and RECYCLE those plastic water bottles! 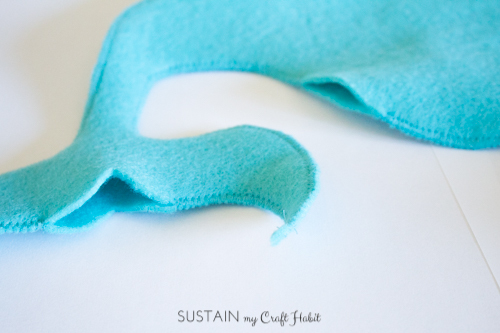 What would you make with your felt fabric? I love your throw pillows! 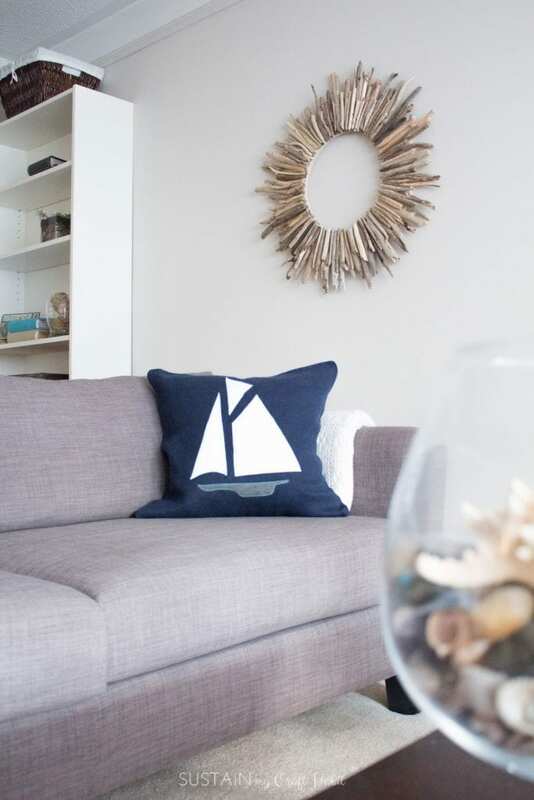 That sailboat against the dark navy makes my contrast loving designer heart happy! 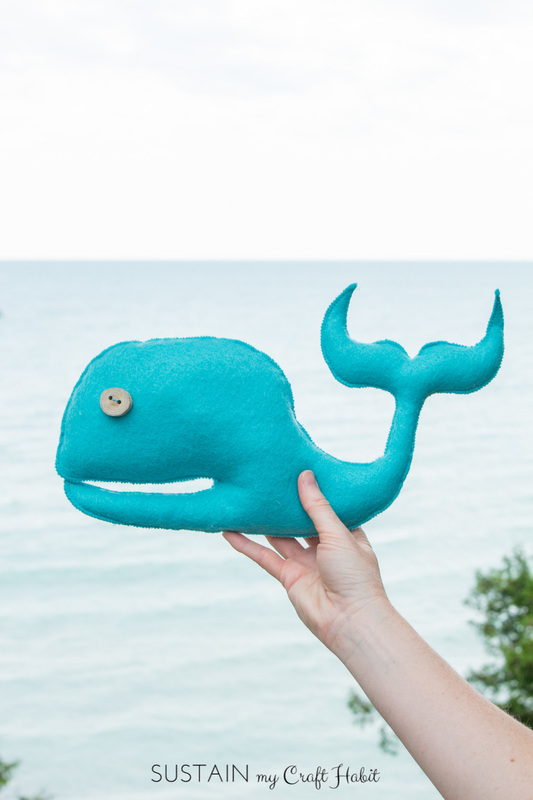 But that whale, he’s so completely adorable and would make a perfect little gift for a nursery! We had a lot of fun making that whale. The kids were all over it! So cute! 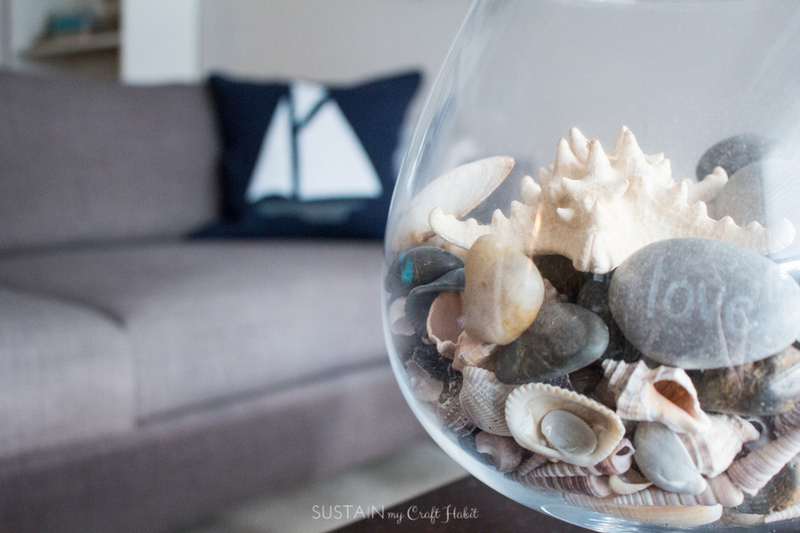 I’m loving your nautical vibe this summer. I was at the lake this week and thinking of you guys as I kept seeing little pieces of driftwood and thinking about your wreath. Great pillows. Thanks, Dannyelle. We are definitely feeling the nautical vibe this summer. I hope you found some goodies at the lake! 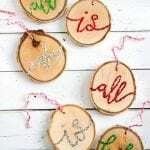 These projects are SO cute!! I bet your kids just love them both! Your instructions are great 🙂 Wasn’t this felt great to work with?! LOVE it! LOVED working with this felt! Was very easy to work with and the colours were just beautiful and rich. We had some left over which the kids actually sewed into their own owl stuffies. Great memories with this felt! 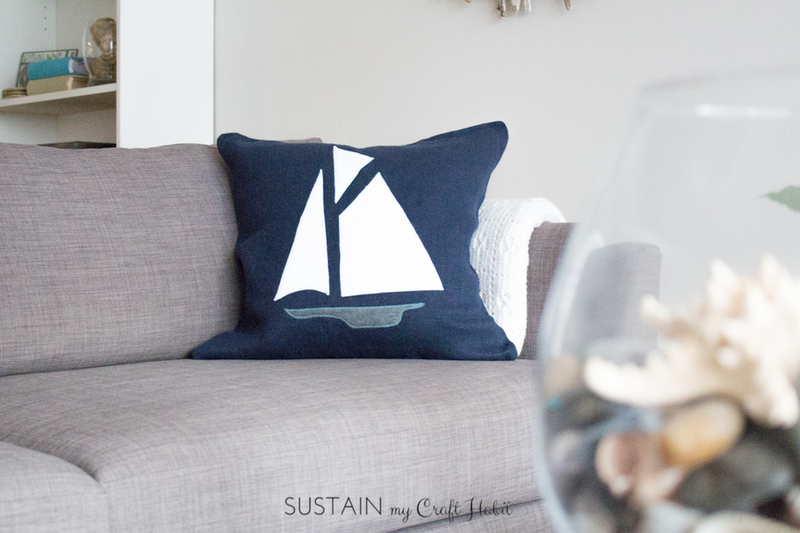 I love both your easy to follow instructions and how both nautical felt pillows turned out! They are a perfect pair and look great together. It was also very interesting to read your information about the history behind throw pillows and how many plastic water bottles are used actually recycled and end up in landfills! 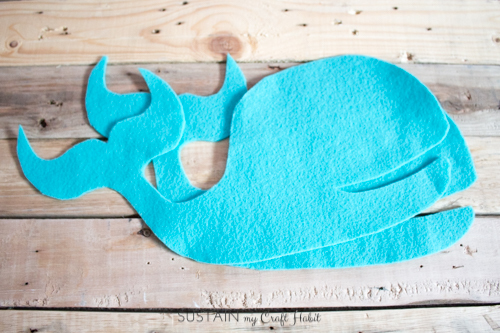 I love that Kunin Felt is made from these recycled bottles! I love everything nautical. These pillows are both so cute. 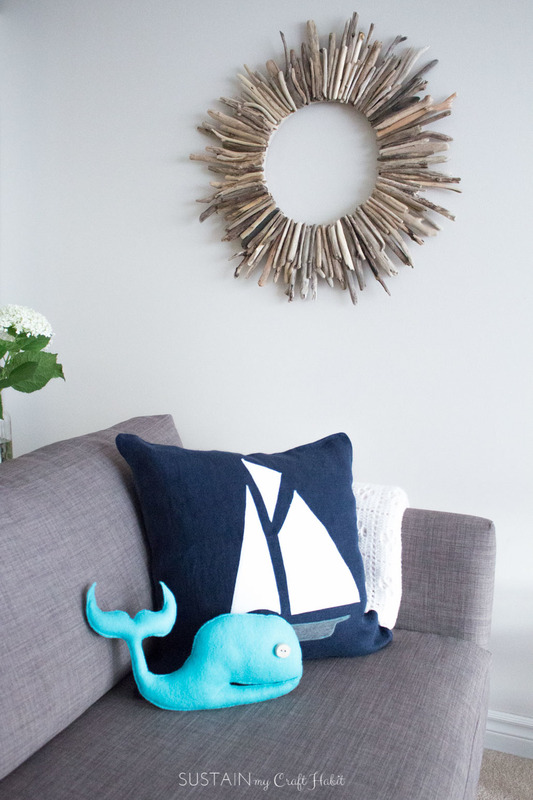 My sons would LOVE the whale pillows and insist they go on their beds (the safe place where all items are their own). Great job! Those pillows are so much fun! 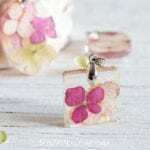 I love the idea that this felt is made from recycled materials. Thanks for sharing all that info! I was very happy to learn that about the felt as well. Makes you feel even better about crafting! Love love love that sail boat and I’m kinda in love with the whale too! Thanks, Jen. That means a lot.